Feature steelwork is playing a crucial part in the construction of an eye-catching addition to one of Bristol’s most historic squares. Steel tonnage: 75tIn the 18th century Queen Square was one of Bristol’s most fashionable addresses. Close to the port and city centre, and built around a large public space adorned with an equestrian statue of King William III, a host of well-heeled Bristolians took up residence here. Unfortunately, a combination of newer and smarter areas of the city being built in the 19th Century and rash town planning in the 1930s that saw a dual carriageway built diagonally across the square, meant that by the 1960s this part of Bristol was in need of regeneration. Luckily the city’s planners recognised that this was a unique opportunity and decided to restore the square. The offending part of the dual carriageway has long since been closed with traffic diverted to surrounding streets. Buildings, forecourts and railings have been reinstated, while the central open space with its promenades has been restored to its former glory. The work at Queen Square is on-going and at number 66 an interesting project is underway that combines a retained and renovated Georgian terrace facing the square, with an adjoining new five-storey office block to the rear, both of which will share a spacious entrance and atrium created with structural steelwork. Dubbed the drum, the entrance/atrium has a reinforced concrete podium with steelwork starting at first floor level to form the upper four floors. The drum features a curving façade (13m radius) and the steelwork cantilevers out by 3m around this curve. 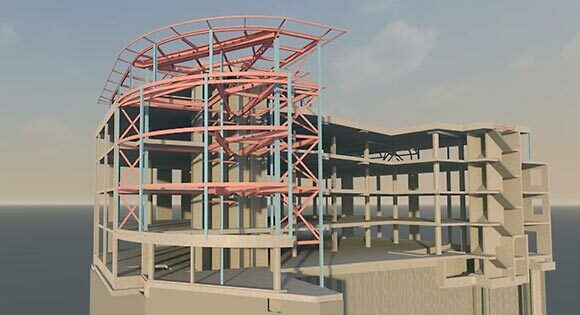 The drum will provide access to the upper floors of the new and retained parts of the project via a staircase, while its predominantly glazed exterior will provide a focal point and bring light into the new building. 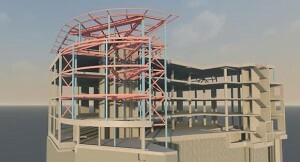 The ground floor of the drum will house the building’s reception area and the first floor is a circulation space only, supporting a feature staircase. Directly above are the toilet and service areas as well as links to the main office spaces. The architect’s vision for the project was to have an open plan ground floor and a large void behind curtain walling to host the feature staircase. “To achieve this vision, the ground floor needed to be as column free as possible. No columns are permitted outside the site boundary at ground floor, therefore most of the structural supports are set back about 3m from the front elevation,” says Gregorry Garson, Senior Engineer at Skanska. From the first floor upwards, each entrance to the respective office space is formed by the steel frame (drum), which is suspended from a twin roof girder configuration that is held up by two steel columns. Deflections, due to permanent loads are diminished within the steelwork by pre-cambering the roof’s girders, as well as the main cantilevering beams at each floor level. Skanska says the use of a 3D analysis model allowed accurate estimates of the deflections, taking into account the cumulative effect of the weight of each suspended floor on the hanger and the effect on the cantilevers at each floor. Mr Bremerkamp adds that the use of a BIM model early in the design process helped to speed up and simplify the construction programme. The overall 66 Queen Square project features a number of elements, such as renovating the Georgian terrace and the demolition of two office blocks built in the 1960s and 1980s. Clearing the site enabled the construction of the new office block that connects into the terrace and the drum. “Apart from some cross bracing and one temporary propping column, the drum is self stable and was consequently one of the first parts of project to be built,” explains Ben Yates, Skanska Operations Manager. For the steel erection programme all of the members were short enough to avoid splicing, and this kept construction as simple and quick as possible. The beams and columns all had studs welded to them, which allowed them to tie to the reinforced concrete frame of the new build. In the long term, the stability of the entrance will be achieved by a combination of steel bracing and shear walls from the main frame. All the slabs are composite, which also helps to keep weight to a minimum, while also enhancing the environmental credentials of the building. 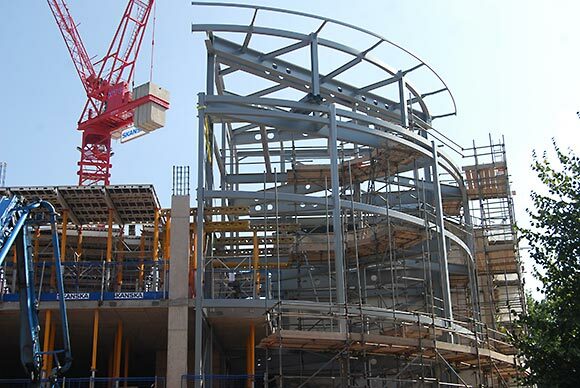 Steelwork contractor William Haley Engineering will make a return visit to site towards the end of the year to install further steelwork to the top of the new build office block. Steel, mostly consisting of raking columns will form feature mansards and pitched roofs along two elevations to mimic the adjacent period buildings. 66 Queen Square is due to be completed in June 2015. 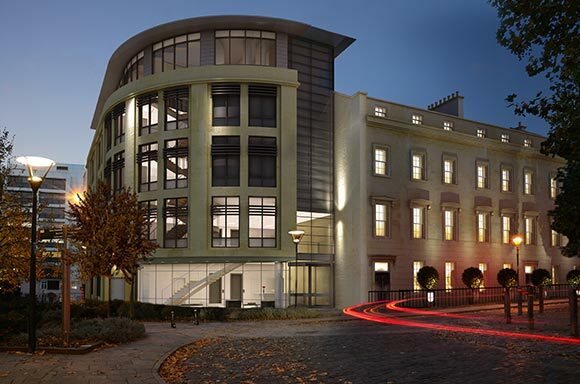 66 Queen Square has been crowned BIM Project Application Award winner at the annual British Construction Industry awards 2014. The award was for Skanska’s approach of tackling the challenges of blending a part-listed building with a new construction. It is the second year in a row that Skanska has scooped the award, following last year’s success with The Woodlands School. The company said the award winning 2014 entry has seen three key objectives being progressed: ‘BIM for free’, ‘BIM for everyone’ and ‘Timing is everything’.